Boca's eye has healed beautifully, and although she has a tiny spot on the opposite eye that we are watching diligently, we were given a clean bill of ocular health by our wonderful veterinary ophthalmologist at our one-year check-up appointment. Boca really cracks me up at the vet's office, and she is a favorite patient. 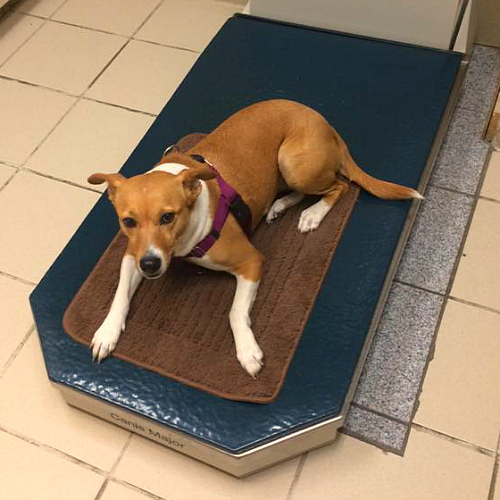 She lays down on the exam table immediately upon entering the room and waits for her elevator ride. She is perfectly cooperative and coaxes treats from the vet. The attending tech promised to take a picture to send to another tech, who was disappointed she didn't get to see Boca. In preparation for our attendance of the BlogPaws pet blogger conference in Phoenix this June, I have been wanting to take Boca on more outings. Since the vet's office doesn't count, we stopped for a rare fast food lunch whereby Boca enjoyed some French fries, then headed to Home Depot to look at rugs for my townhome. I absolutely love having laminate floors with pets, but the rugs definitely take a beating and need replaced every few years. Boca was so good in the store, and attracted a great deal of attention, with employees wanting to pet her and customers wanting to know what kind of dog she is. We saw several other dogs and one young Rottweiler/Shepherd type desperately wanted to meet her. Boca was her typical chill self, politely sniffing and allowing herself to be sniffed. She relaxed under my chair while I ordered the rugs, and cheerfully acknowledged her many fans. I was so proud of my exotic island mutt! The following day we had another outing, meeting my friend and her corgi at a local breed club's event. It was not what I expected, but there was enough activity that Boca got more practice at being social in a new setting, and once again impressed me. She is happy to sprawl out in the middle of things, not getting overly excited about what other dogs are doing. 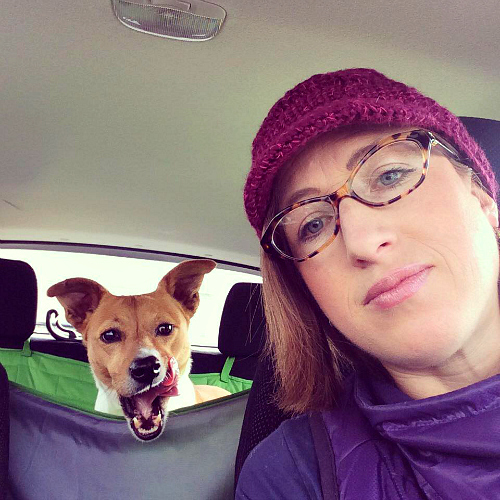 I'm confident that we will be ready for the crowds at BlogPaws by June, and looking forward to my very first road trip with my potcake! That's so awesome that Boca's eye is all better and it's good you are watching the other one! It's so weird that she had that ordeal. I still wonder what the heck happened. Poor girl! That's so exciting that you and Boca get to go to Blogpaws! I think it's a great idea that you're taking her on smaller outings to prepare for it! I'm so glad Boca's eye is better. The whole situation was so stressful to read about, I could only imagine living it. I'm so glad you ended up finding what sounds like the perfect opthamologist. Glad that Boca's eye is better! Health problems with my dogs are so stressful and I appreciate when others share their experience. It's nice to have that extra bit of knowledge. So glad to hear her eye has healed nicely! I bet that is a huge relief! It is great having a dog you can take anywhere. I'm sure Boca will be a star at Blogpaws and I'm just sorry I won't be there to meet her, and you. Perhaps another year. I'm SO excited to meet you both at BlogPaws! And, you're going to have so much fun. My solo road trip with Emmett is one of my most treasured memories. It was a better bonding experience than I could've dreamed. Looking forward to reading all about your adventures!